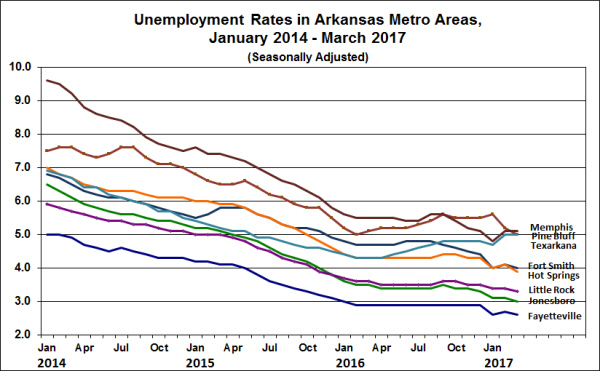 New data on unemployment in Arkansas metro areas shows rates generally continuing to trend downward in March. 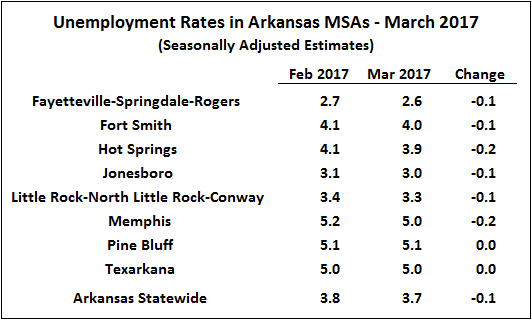 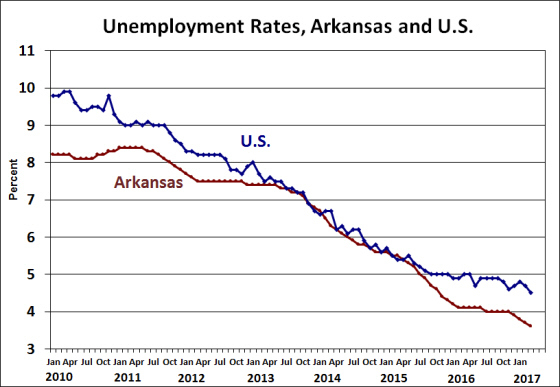 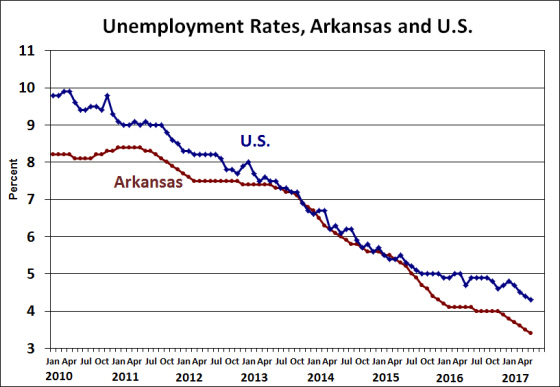 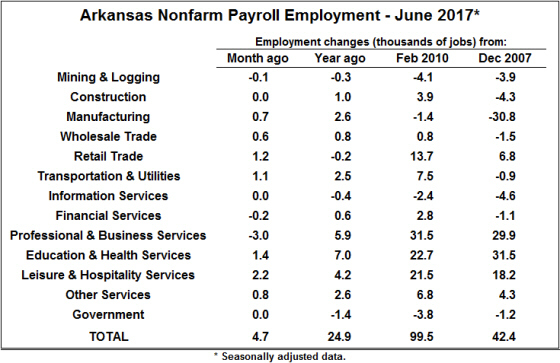 The exceptions were Pine Bluff and Texarkana, each of which had unemployment rates that were unchanged from February. Elsewhere in the state, unemployment rates ticked downward by 0.1 or 0.2 percentage points. Compared to twelve months earlier, rates are down approximately one-half of a percentage point in most of the state’s metro areas. 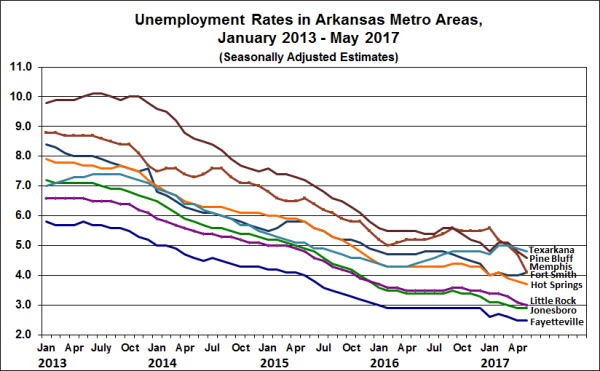 Unemployment in Memphis is the same as it was a year ago. 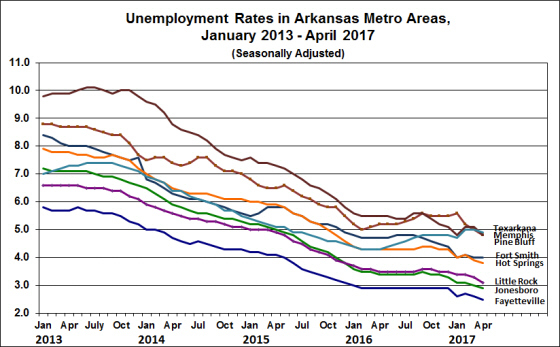 In Texarkana, the unemployment rate was on the decline through early 2016, but has edged up by one-half of a percentage point since March of 2016. The figure below shows current rates and recent trends for unemployment rates in metro areas around the state. 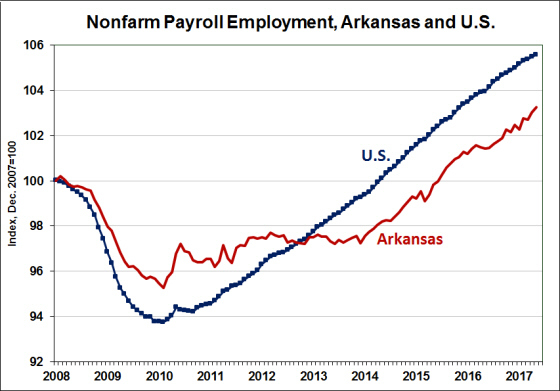 Statewide nonfarm payroll employment was essentially unchanged in March. Monthly changes in the state’s metro areas were mixed. Fort Smith and Jonesboro both saw declines of over 1 percent. 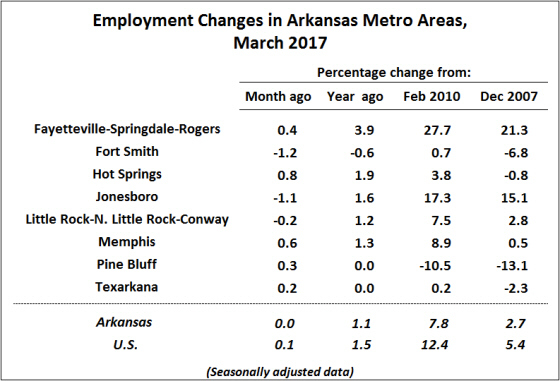 Employment in other metro areas was up slightly. Over the past year, Pine Bluff, Texarkana and Fort Smith have seen zero or negative employment growth, while the other MSAs have seen employment expand. The Fayetteville metro area continues to exhibit the strongest growth in the state. 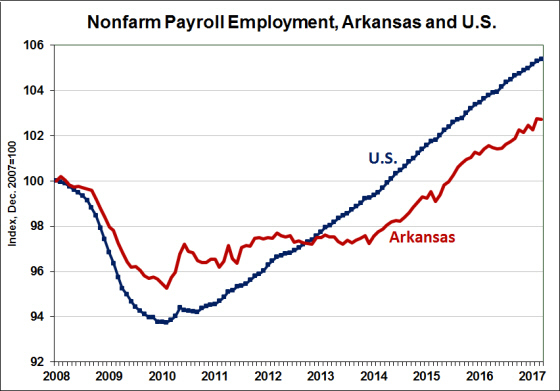 Over the longer run, employment growth trends have diverged significantly during the current economic expansion. Fayetteville and Jonesboro have grown steadily since the end of the great recession, but other metro areas have experienced slower growth. 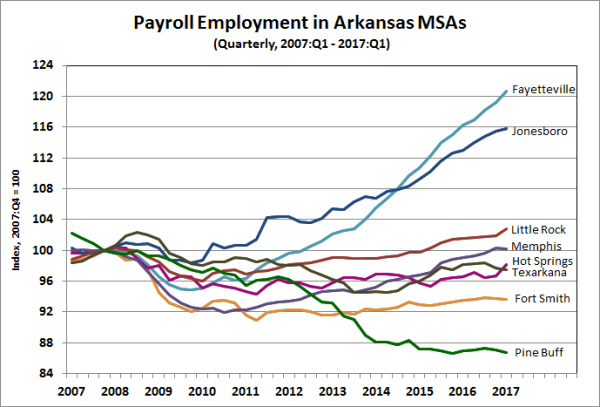 Among the state’s other metro areas, only Little Rock and (as of this month) Memphis have surpassed pre-recession employment levels. The Arkansas unemployment rate set another new record low in March: 3.6%. Having declined by 0.1 percentage point in each of the past four months, the state’s unemployment rate is now 0.9% lower than the national average. 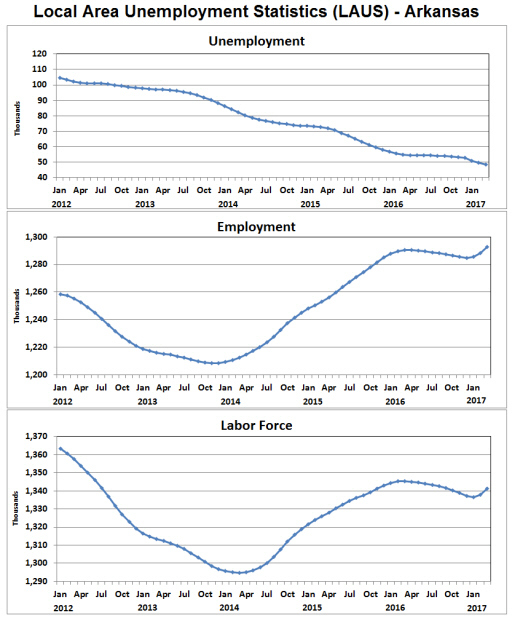 March’s decline in the unemployment rate was underpinned by an increase in the number of employed (+4,428) and a decline in the number unemployed (-1,240). 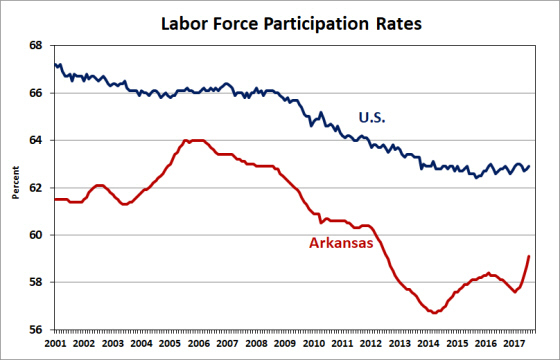 As a result, the participation rate was up for the second consecutive month, after declining steadily during 2016 and into the first part of this year. Nonfarm payroll employment was essentially unchanged in March (seasonally adjusted). Professional and Business Services continued to show strong growth, increasing by 1,200 jobs from February to March. 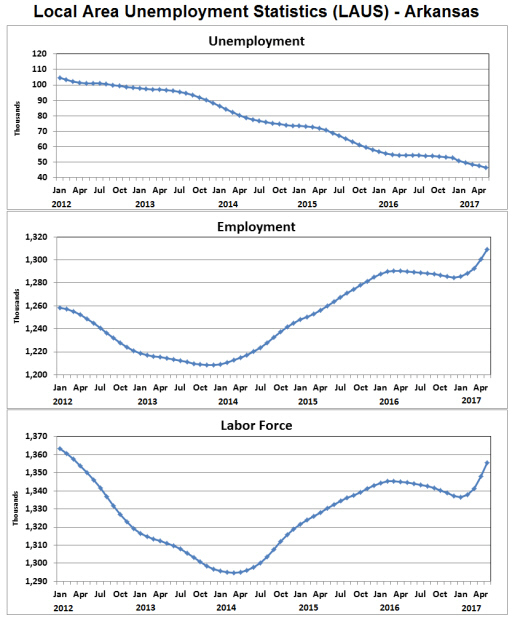 Education and Health Services showed an uncharacteristic decline for the month, but remains the single largest generator of job growth among the major super-sectors over the past 12 months. Construction employment would ordinarily be expected to increase this time of year, but the warm early spring months was associated with earlier-than-expected increases. 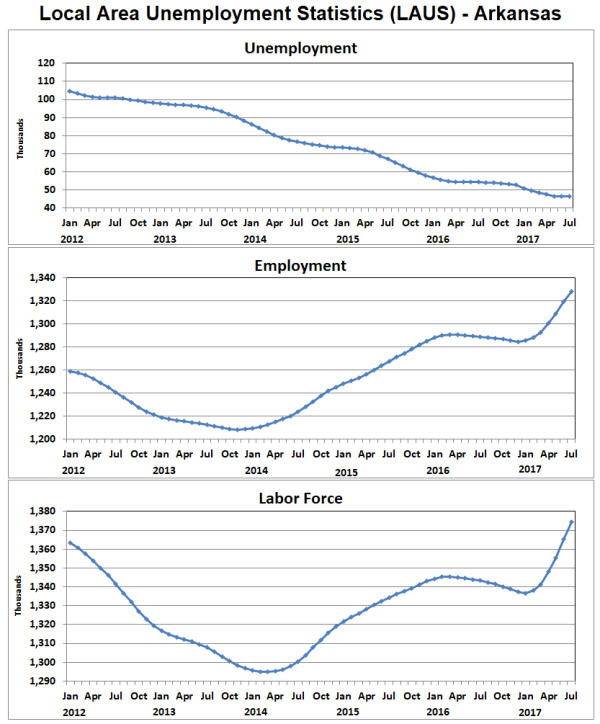 As a result, with not-seasonally adjusted employment unchanged in the construction sector in March, the seasonally-adjusted figures register a decline of 800 jobs. 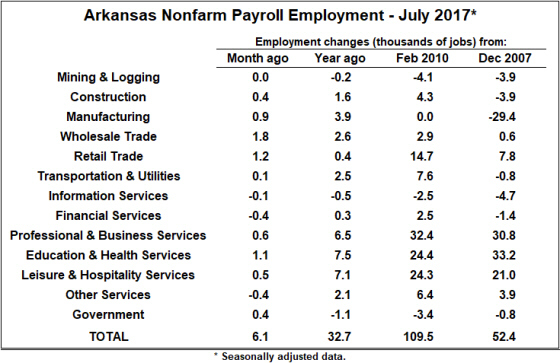 Manufacturing continues to show signs of improvement, having added a cumulative total of 3,100 jobs over the past year. 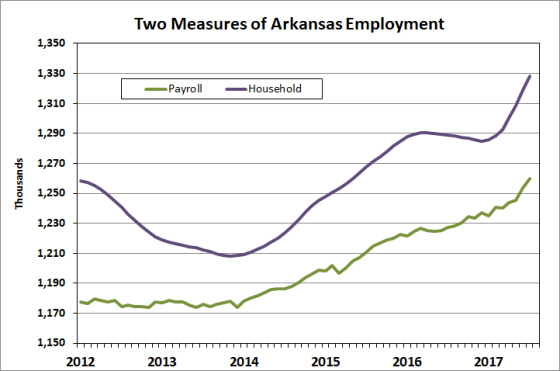 Compared to its pre-recession level (December 2007), Arkansas employment has increased by 33,100 jobs — about 2.8% growth. 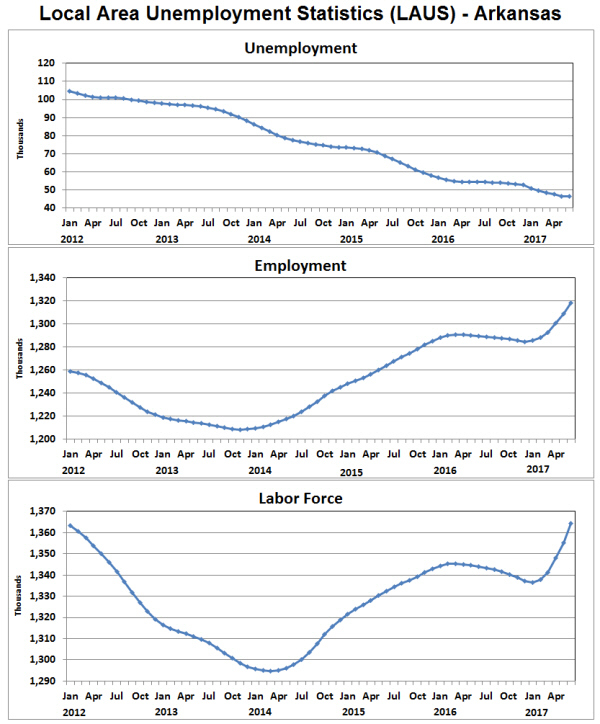 Over the same period, employment nationally has increased by 5.3%. 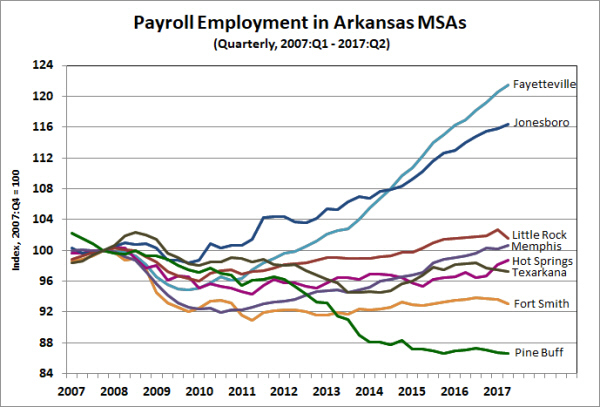 That long-run comparison includes a period of relatively stagnant job growth in Arkansas — from around 2011 through 2013. 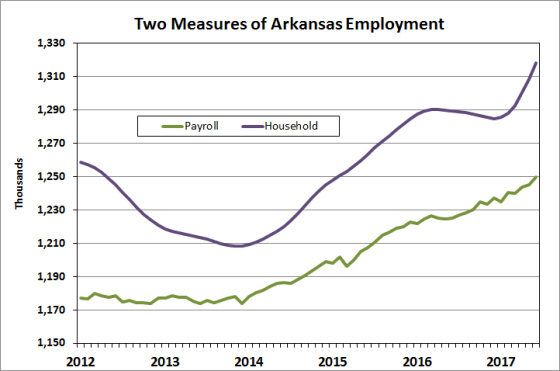 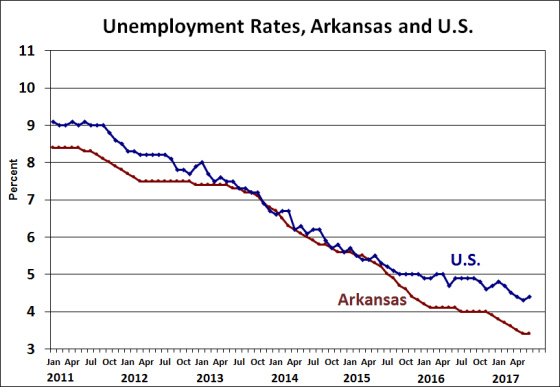 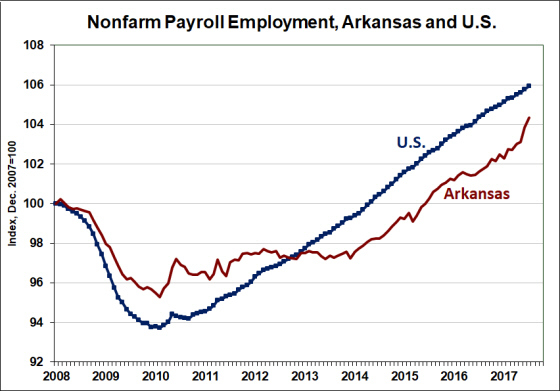 More recently, Arkansas employment has tracked the national growth rate more closely: Since the end of 2013, Arkansas employment has expanded by 5.7%, compared to 6.2% nationwide.